Milan of Hawaii: The truth about Hawaiian pizza, or how I became front page news in the neighborhood. 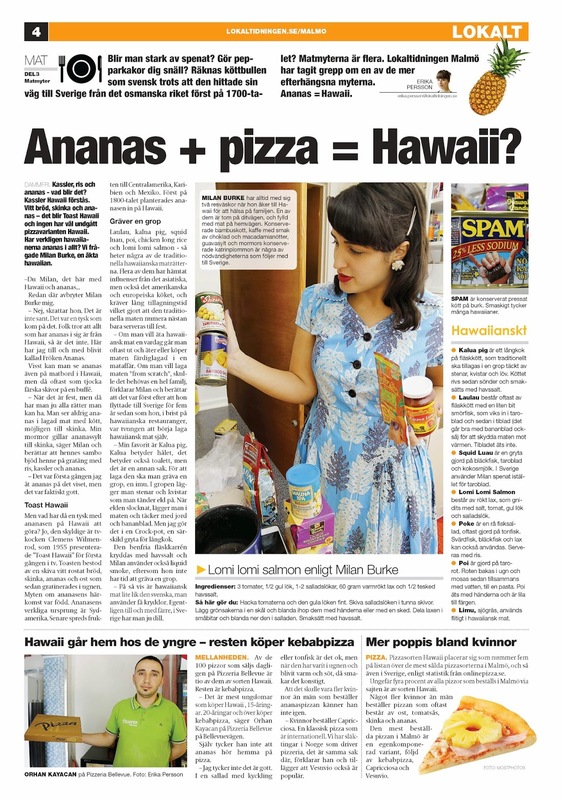 The truth about Hawaiian pizza, or how I became front page news in the neighborhood. 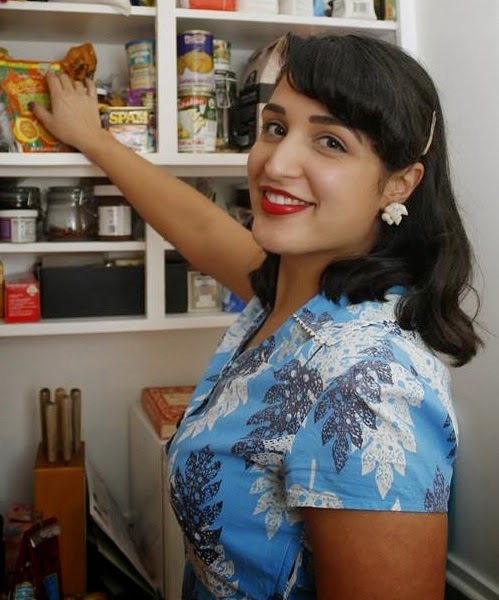 Although I mean for my blog to be dedicated to vintage, those of you who know me know that another big love of mine is food. I love trying new kinds of food, talking about food, reading about it, looking at it, just anything really. Match that up with my love of home and, well, I could be here a while. 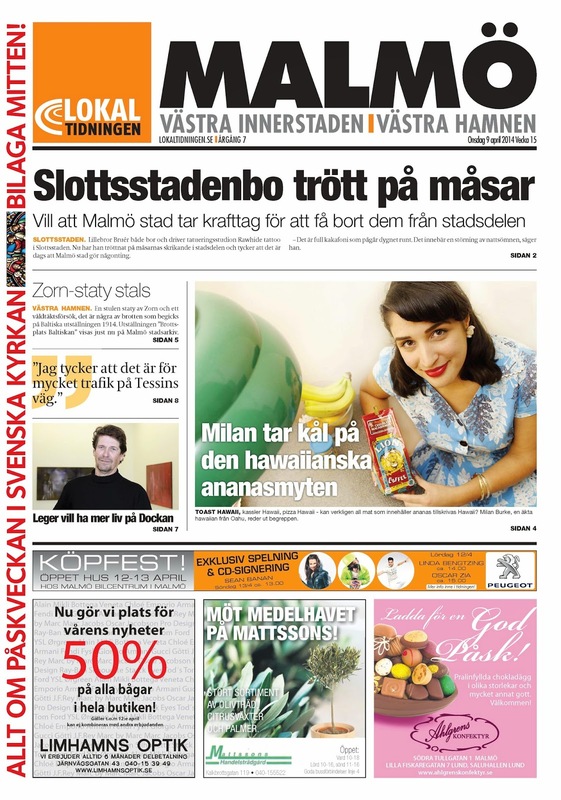 So you might understand my excitement when my friend Erika, an editor at Lokaltidningen, a local newspaper for my part of Malmö, asked if I’d be willing to talk about Hawaiian food! It was a nice page long article and I even got to be on the front page of the paper too! 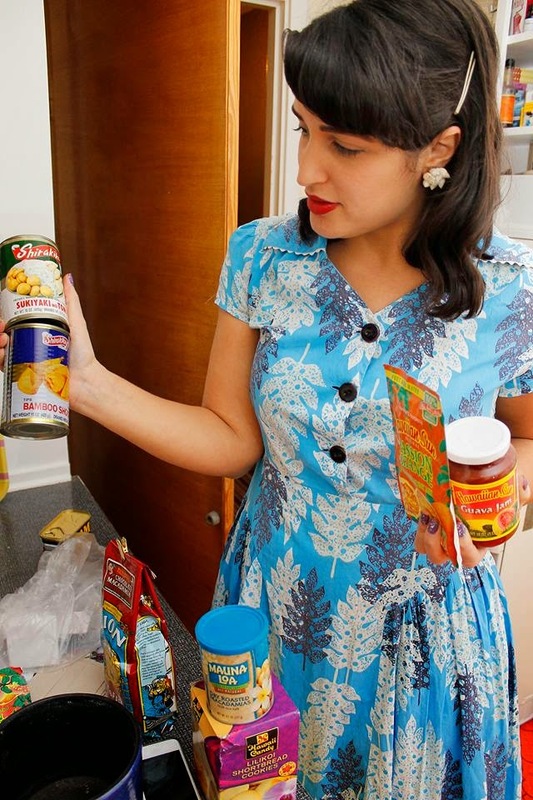 I took the chance to bust out my vintage 1950’s Hawaiian-ish dress and pretty shell earrings I got at FN92 in Copenhagen. It might be from Hawaiʻi but I actually have no idea where the dress came from. The print reminded me of lauaʻe and the buttons are made of coconut. It was a beautiful vintage dress that reminded me of home. I had to have it! Happily enough, there were a perfect pair of clip on shell earrings waiting for me at FN92 as well. Many Swedes are curious about Hawaiʻi's association with pineapple and often think that pineapples are originally from Hawaiʻi. We talked about the Hawaiian Pizza / pineapple=Hawaiʻi myth (which actually has its origins in Germany!) as well as what real Hawaiian food is. I talked about everybody’s favorite lūʻau foods and I even provided a recipe for lomi lomi salmon! I showed off some of the food I brought back to Sweden with me when I was home over Christmas and New Year’s so we could get some shots for the article. It was nice to talk about the local food traditions we have in Hawai’i. We just call it "local food-" a blend of all the foods and flavors of all the cultures that call Hawai’i home. It’s a special combination you won’t get anywhere else! I hope that people found Erika’s article interesting and enlightening. It seems many people here are curious about or have misconceptions about Hawaii. And I suppose it’s no surprise - Hawaiʻi is literally on the other side of the globe. People back home also have some misguided notions about Sweden - mostly that it is Switzerland and that polar bears roam freely, so I guess it’s about even. My first Easter as a Swede!